Sit back and relax while enjoying a nice frosty drink out of your new Engraved Glass Mug. 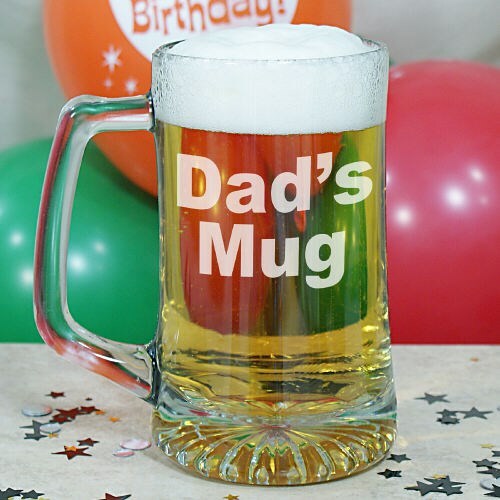 Perfect for celebrating someone's special birthday or make it a great gift idea for Dad on Father's Day. Your Custom Message Glass Mug is a Large, High-Quality American Arc glass mug. Each Personalized crystal clear glass mug contains a heavy base and strong handle to support large drinks; holding 25 oz. Includes FREE Engraving! Personalize your Glass Beer Mug with any two line custom message. Additional Details This Personalized Mug makes a fantastic birthday gift idea! Shop 800Bear.com to add a unique Personalized Birthday Gift to your fun Teddy Bear gift idea. Be sure to capture fun birthday memories with an Engraved Happy Birthday Picture Frame as well.